MANUFACTURED LANDSCAPES is a documentary by directer Jennifer Baichwal and DP Peter Mettler that attempts to translate Canadian still-photographer, Edward Burtynsky's photos to cinema. 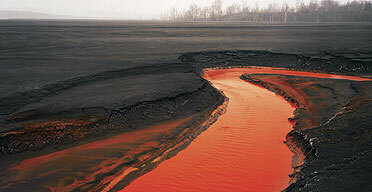 Burtynsky's specialises in landscape photography. But, radically, instead of photographing pretty pastoral scenes, he focuses on landscapes that are the results of human consumption - rivers polluted with industrial waste; garbage dumps; gigantic factory floors in new Chinese industrial towns; American hills ravaged by open-cast mining. The shocking thing is that his pictures are stunningly beautiful - perfect balance, great colours - until you look closer and realise that you're looking at a heap of old electronics components or a polluted river. The work is powerful in terms of this disturbing play between beauty and destruction, and in terms of its scale. By translating the stills into cinema, Jennifer Baichwal allows the viewer to look into the pictures and to, occasionally, hear Burtysnky's interpretation of his work. Just the sheer time it takes for a camera to traverse a gigantic Chinese factory floor is powerful. And the close-up of a woman's hands rapidly assembling a power-breaker, dexterous, monotonous, takes us to a place beyond stills photography. The resulting film is beautiful, disturbing, thought-provoking and transformative without being overtly didactic. To that extent, it reminded me a lot of OUR DAILY BREAD, which put the industrial food business under the microscope. MANUFACTURED LANDSCAPES played Toronto 2006 and Sundance 2007. It opened in Belgium, the US, the Netherlands and France in 2007 and in Spain, the UK and Japan last year. It is on release on DVD.